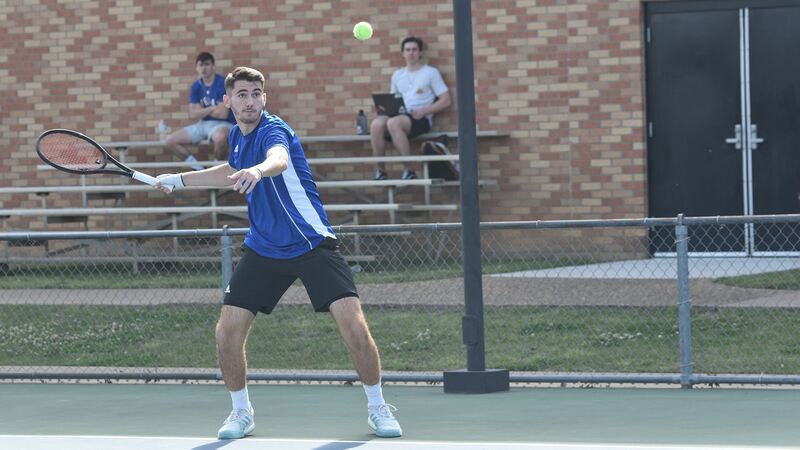 LeTourneau Men’s Tennis Grabs Key ASC Victory Over ETBU. LONGVIEW, Texas – In a battle of American Southwest Conference East Division preseason favorites, the LeTourneau University men’s tennis team would win four of the first five points of the day and never look back in an 8-1 home victory over East Texas Baptist University at the Davis Tennis Courts in Longview, Texas on Wednesday, April 3. Earning their ninth win of the year, LETU is now 9-6 on the year, and 2-0 in ASC play as the YellowJackets sit one win away from their first double-digit season win total since the 2013-14 season. ETBU is now 5-8 overall, and 1-1 in ASC play after dropping their second straight match. It would be a clean sweep during doubles action for LeTourneau as LETU would take all three doubles matches to jump out to a 3-0 lead going into singles action. Both the number one doubles match featuring Jimmie Henson and Christian Farris and the number three doubles match with Nathan Schmidt and Bobby Clark would be won by scores of 8-3 while James Estrada and Zac Crowley-Kurth battled at number two doubles for an 8-6 win. Henson and Farris carried over their dominant doubles play into singles action as Henson made quick work of his opponent at number one singles with a 6-2, 6-3 win while Farris earned a 6-3, 2-6, 6-2 victory to clinch the team match. Crowley-Kurth battled back from a 6-5 deficit to force a first-set tiebreak before eventually falling 7-6 (7-5), 6-3 at number three singles while Schmidt earned a 6-2, 6-2 straight-sets victory at number four singles. In his only action of the day, Paulo Cressio would take a 6-1, 6-3 win while Clark earned a first set and third-set tiebreak win in a 6-0, 4-6, 10-6 win at number six singles. Two straight road matches in ASC play is scheduled to begin on Saturday, April 6 at 10:00 a.m. when the YellowJackets travel to Clarksville, Arkansas to take on the University of the Ozarks at 10:00 a.m. If weather forces a schedule change to the match, an official announcement will be made on the LeTourneau University Athletics website as well as social media accounts with a new date and time.